Pengda Liu, PhD, was awarded a V Scholar Grants in 2018 by the V Foundation for Cancer Research. With the funding, Liu will advance laboratory research into prostate cancer that has become resistant to treatment. Specifically, Liu and his team are studying the role of a protein, cGAS, as a potential tumor suppressor in prostate cancer. They found in previous studies that there are lower levels of this protein in cancer that becomes resistant to treatment. 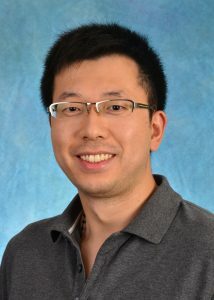 “We are hopeful that our studies will enable new therapeutic options for prostate cancer patients, with potential relevance to a subset of lung cancer,” said Liu who is an assistant professor in the UNC School of Medicine Department of Biochemistry & Biophysics. Liu was one of 28 scientists who were awarded V Scholar Grants in 2018. The two-year, $200,000 grants are designed to identify and advance innovative young scientists who are establishing their research careers. They are meant to provide the most promising researchers a competitive edge in receiving additional funding from other sources. The V Foundation for Cancer Research awarded a total of $25 million for cancer research in 2018 – bringing the total amount awarded by the foundation in 25 years to more than $225 million. The foundation has a Scientific Advisory Committee comprised of researchers from prominent cancer centers to oversee the grant-making process to ensure proposals meet the highest standards. Click here to read the V Foundations’ announcement. Story courtesy of UNC Lineberger. To arrange a press release please contact: Carolyn M. Clabo, UNC Biochemistry Communications.